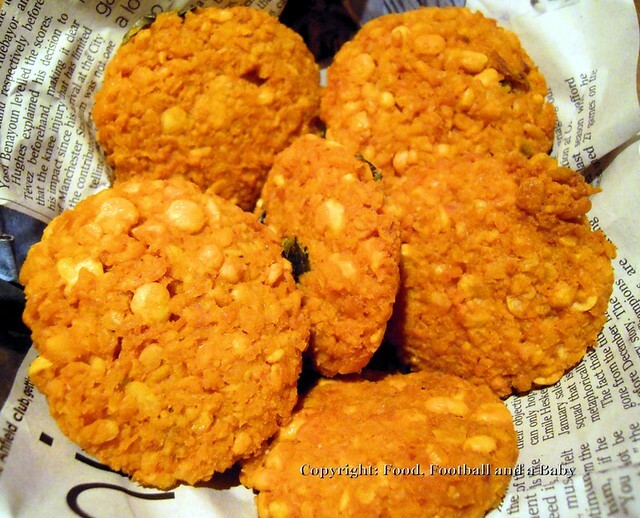 Chattambades are a delicious street snack from the Malabar coast. I thought they were pretty unique to Mangalore, until I had the Masala Vada in a London Kerala/ Sri Lanka restaurant (yes, really, the place is called the Palm Palace and its bang opposite Quality Foods in Southall!) and realised they were one and the same. Of course I then wanted to eat them constantly, and when my mum showed up in England, I was constantly badgering her to make them. She's a lovely mum, and she did. And they were delicious and tasted just as I remembered from Mangalore. For some strange reason, for the past few days I had been craving these chattambades. The problem with making them is that they are really not a spur-of-the-moment snack. While chana dal or yellow split peas and curry leaves are a staple in my pantry and freezer, you do have to be fairly organised to soak the dal the night before, as its are ground raw with the seasonings. As usual, I tend to keep the spice down as Aditi doesn't really enjoy very spicy food but loves these chattambades. So feel free to increase the spices to your taste. Anyway, to cut a long story short, I got myself organised, and I soaked the dal the night before. 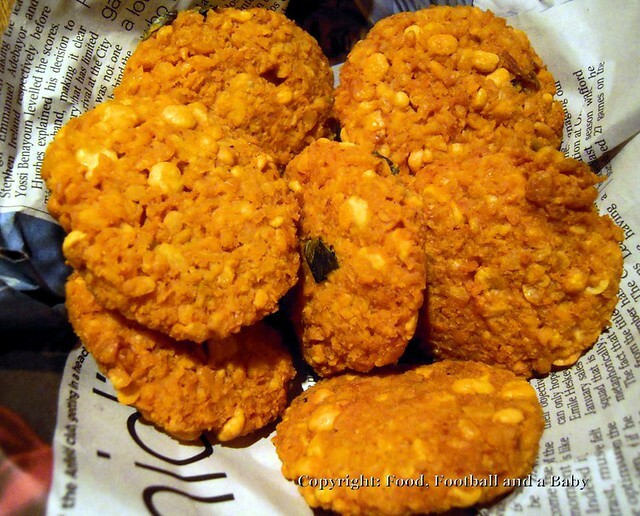 The next day yielded these delicious crispy, chewy snacks that we all gobbled down with coconut chutney and hot cups of chai. Soak the dal with double the volume of cold water, overnight if possible, otherwise, at least 6 hours. The dal will fluff up a little bit, as it absorbs the water. The next day, drain the dal well and grind coarsely with the red chilli or chilli powder and the peppercorns, WITHOUT adding water. Don't process into a smooth paste as you want pieces of whole dal, it really adds to the texture of the finished vadas. Scrape out the ground dal iunto a bowl, and add the chopped green chillies, curry leaves, gram and rice flours. Mix thoroughly, then season with the salt to your taste. Heat the oil until a drop of the vada batter rises quickly to the top covered in bubbles. Then drop in the chattambade, and deep fry until they turn golden. Take out of the hot oil, and drain on kitchen paper. The chattambades should be crispy on the outside and moist and chewy on the inside. Serve hot with coconut chutney or ketchup and a hot cup of chai!!! Bliss!! Super recipe Michelle. I tired them minus the besan though, since my stock of besan was too old! But they turned out great anyway. Some people add coconut too.... do u know this version?